The secret hideaway village of Pucisca. In early September, my thoughts turned to visiting Pucisca, located in a well hidden cove on the Island of Brac. Many times I had sailed past this deep navy-blue water inlet, but had never ventured inside.Today was the day! 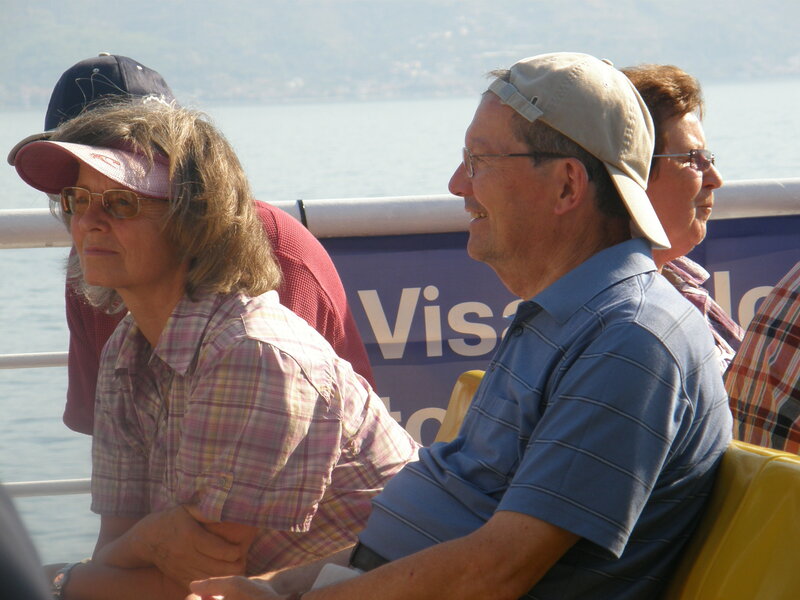 The ferry from Split to the seaside port of Supetar sails many times daily, back and forth, carrying cars and passengers, goods, bikes and all kinds of supplies. The ferry was packed with foreign tourists, making their way to one of the many popular summer resorts, particularly the famous town of Bol and the even more famous beach called ‘Zlatni Rat” (Golden Horn) but my destination was the well-hidden and magical secret place called Pucisca. 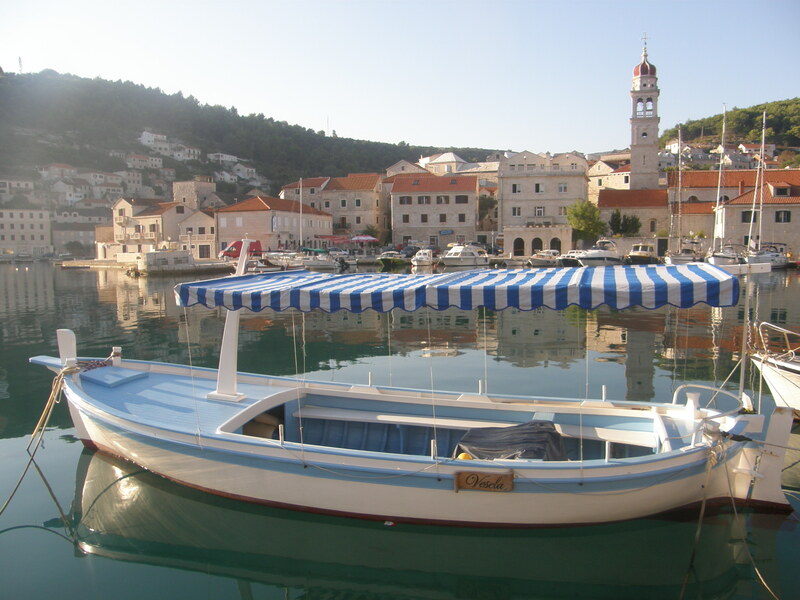 The ferry moored in Supetar, and soon I was on my way to Pucisca, a further 22 kms, driving south along the coastline. The views looking back across to the mainland were spectacular, with the Biokovo mountain range on the horizon, a truely majestic sight! 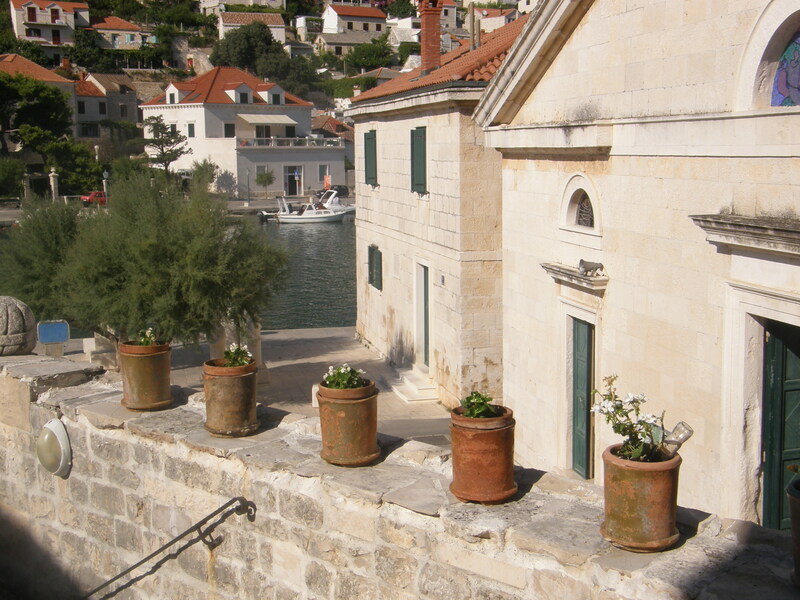 The cathedrals, palaces, villas along the Dalmatian Coast were built from the stone quarried from here, near Pucisca. Perhaps the most well-known of all is the White House in Washington DC. 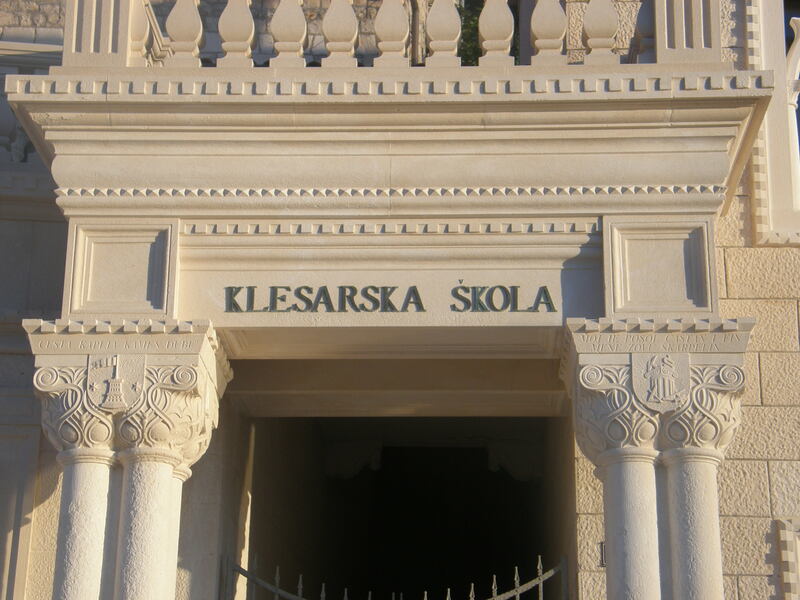 Today the stone is still being quarried, sculpted and used in the building of more expensive homes. On offer to all, tame and wild, shameless and poetic,the beauty of Brac is a beauty of colours; the white of the stone, the blue of the sea, the green of the vieyards, pine trees and holly, the silver of the sage, rosemary and olives. Throughout the centuries, the winds and the sun have not faded those colours. 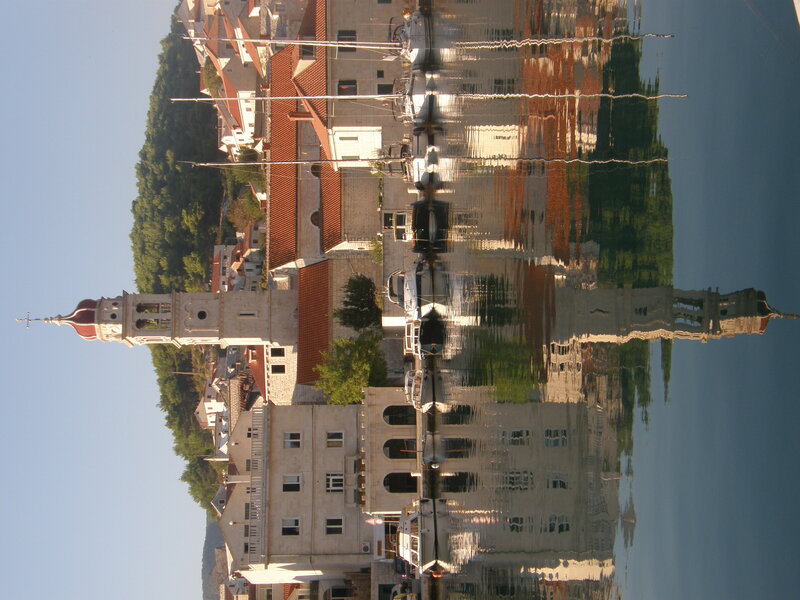 Quite the contrary, a number of artists, poets, sculptors and painters from Brac have captivated this beauty, verbally and visually; the intoxicating fragrances, and delicious tastes, the island’s vibes and fibres, and the people of Brac themselves. On Saturday afternoon a wedding was in full swing! Church bells ringing, music, dancing, singing, food and wine all night. as I went for my early morning walk, I found them still singing, a bit bleary eyed and a bit worse for wear after all the festivities, but still in harmony and full of wedding cheer, Dalmatian style! Less expensive yet excellent accommodation can be found at Tonka Mladinic’s apartments. 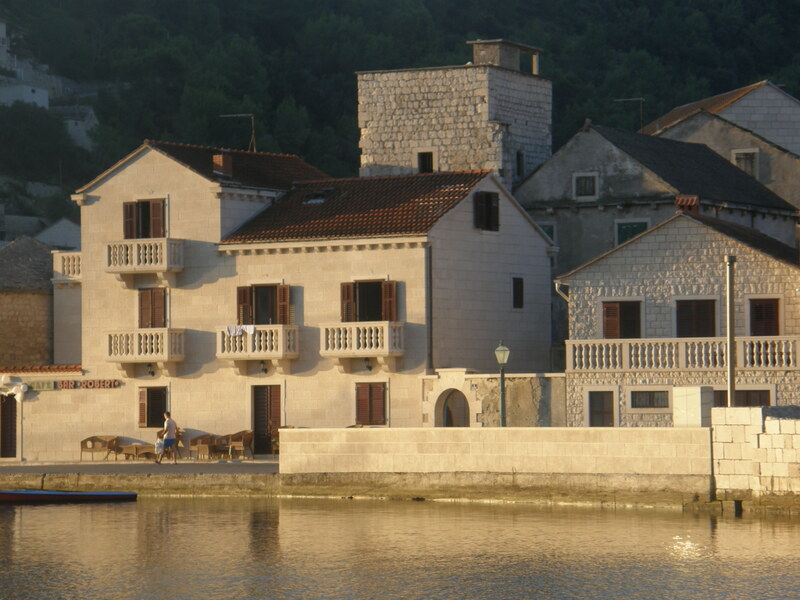 Visit www.apartmani-mladinic.com a stone’s throw from the picturesque harbour, yet offering a peaceful night’s sleep during the busier summer season. Tonka’s son, Marko, took me for a drive to their family olive grove a little way out of Pucisca. 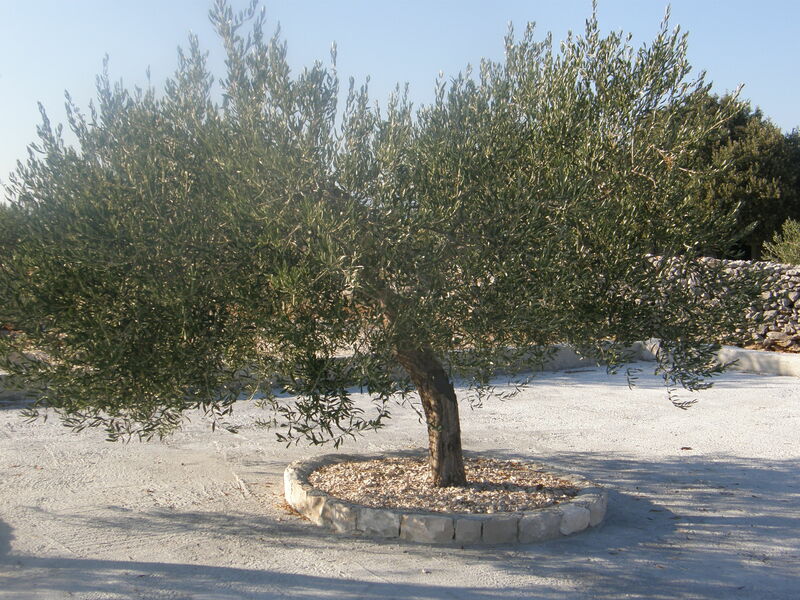 The olive trees are well taken care of, the ground is kept free of weeds and well fertilised with organic manure. Olive oil is produced here in huge quantities and the quality is absolutely superb! A 10 km drive across the island to the southern side brings one to the tourist mecca of Bol. Once a village of wine-growers, fishermen, and sailors, Bol has been transformed into a haven for those seeking pristine pebbled beaches, a sapphire coloured sea, summer nights of entertainment, restaurants, bars under the pine trees along the beach, romance, and well known for a great place to wind-surf. An ideal place for parasailing, scuba-diving and sailing. Hi! 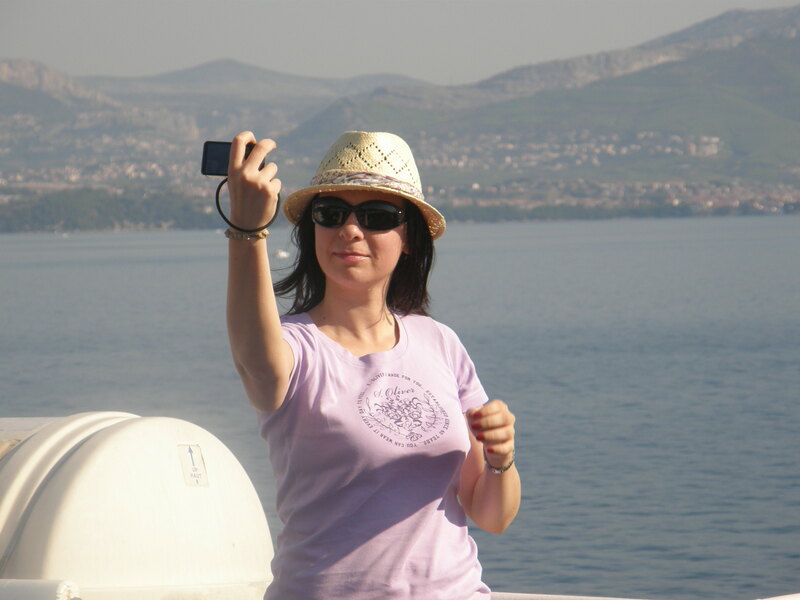 Do you take these photos yourself? They are amazing…I particularly like the first one with the reflection of the buildings in the water. Love this “well hidden and magical secret place” called Pucisca. Your photos capture it beautifully. Extra special to me as it was my father’s home town. We are glad that you liked the apartments Mladinic and enjoyed your stay .Tonka, my mom and Mark , my brother send greetings from Pucisca! The olive grove is now also being rented with a big swimming pool.take a look on our websight. Hi Karmen, Lovely to hear from you. I will certainly have a look at your website…It is always a pleasure coming to Pucisca. I look forward to seeing you and the family once again …please say hello to everyone. Dear Vesna, Thank you for your positive comments. I was fortunate to have been in Pucisca last year 2015 and attended one of the music school evening recitals…It was breathtakingly magnificent! I will add your information link to my website. Thank you!